The live feed of our Tuesday jazz music radio show streaming online at 4:00 PM Pacific with a focus on the history of jazz music and jazz music that swings from the 1930s to today. The sordid history of our jazz music radio show, est. 1985. Lends credence to the theory that FCC radio deregulation survival may be linked to narcissistically twisted disorders. 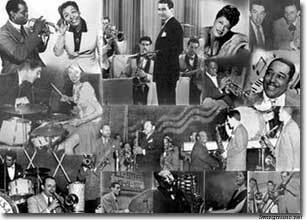 Early hot jazz bands, the hotel dance bands and the history of jazz music leading up to the Big Band era. The role of economics, early recording technology, and radio relative to jazz history and the Big Band era. Scans of a 1942 Down Beat magazine article detailing a dramatic event in jazz history during the Big Band era; the James Petrillo / AFM recording ban. Another of the many jazz magazine articles on the site detailing big events in jazz history. This piece recounts the Count Basie vs. Chick Webb big band music Battle Of Swing held at Harlem's Savoy Ballroom in January of 1938. Jazz biographies and photos are added regularly. Our weekly live jazz radio program Jazz Joint Jump can be heard Tuesdays from 4-6PM Pacific Time through the link on our Jazz Radio page.